Windows 7: go on, touch it. As you may have heard, Microsoft has been showing off the latest pre-beta version of Windows 7 at its Professional Developers Conference in Los Angeles. 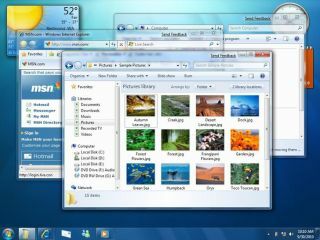 This will be the successor to Windows Vista, and is scheduled to be released at some point in 2009. You can read a hands-on test of Windows 7 over at our sister site TechRadar, but I think that the most interesting feature for musicians is the introduction of support for multi-touch technology. Users of Apple's iPhone and iPod touch devices will know all about this, as will anyone who's tried JazzMutant's Lemur and Dexter controllers. However, having multi-touch support built into a computer's operating system represents a whole new ball game. It's possible that we may finally be able to get truly hands-on with our DAWs and plug-ins. We'll be able to tweak buttons, knobs and sliders almost as if they were real. Lemur and Dexter are great, and standard hardware controllers do a good job of giving you a degree of tactility, too, but they're all a step removed from actually being able to touch what you're controlling. However, before we all go completely gaga over the prospect of multi-touch technology, let's just have a little think about how it might work in practical terms. Anyone who wants to use it will have to invest in new hardware, for a start - although the price of touchscreen is coming down all the time - and then we come to the issue of design. "We'll be able to tweak buttons, knobs and sliders almost as if they were real." I certainly wouldn't want to be reaching across my desk to touch a display when I was making music - it's possible that tablet-style computers will become the order of the day (Apple has long been rumoured to be working on one of these). The look of our software might have to change, too. It's all very well being able to move controls on-screen, but many plug-in interfaces are small and fiddly, meaning that using your fingers to tweak them would be a real trial. The launch of Windows 7 will be a big moment in the advancement of multi-touch technology, but there's still some work to do before musicians can start to think about ditching their keyboards and mice for good. The concept of removing the barrier between user and software is sound, but the implementation has to be right, too.